My pictures do not do the mosaics and frescoes justice. They are stunning. St. Savior has the finest Byzantine mosaics and frescoes that can be found. This is must stop when visiting Istanbul. The mosaics and frescoes depict the genealogy of Christ, the life of the Virgin, the infancy of Christ, Christ’s ministry and other frescoes. The present church building dates from the 11th century. It was remodeled between 1315-1321. Today it is a museum. 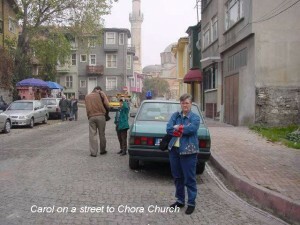 The neighborhood around the church is picturesque. We loaded the bus and headed across town to the Topkapi Palace. Wow.